Canadians held the Winter Olympic Games worthily, discounting some tragedies and problems. Opening day was overshadowed by the death of a luger in a training-run crash. The finale couldn't have been more festive — a tribute to the organizers, who persevered despite first-week setbacks, and to the Canadian team, which surged to glory after a shaky start. A crowd of 60,000 filled BC Place Stadium for Sunday's closing ceremony, many of them Canadians reveling in the overtime victory over the United States just a few hours earlier by their men's hockey team. That win, in the games' final event and in Canada's most cherished sport, gave the host nation a Winter Olympics record of 14 gold medals and set off wild celebrations across Vancouver. 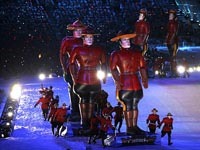 The gaiety in the stadium — capped by a rock concert with Alanis Morissette, Nickelback and Avril Lavigne — contrasted sharply with the moment of silence at the opening ceremony Feb. 12 for Nodar Kumaritashvili, the luger killed in a horrific crash on the sliding track in Whistler just hours before that ceremony. The speakers of honor on Sunday, chief Vancouver organizer John Furlong and International Olympic Committee president Jacques Rogge, each paid tribute to the 21-year-old athlete. "We are so sorry for your loss," Furlong said, addressing the nation of Georgia. "May the legacy of your favorite son never be forgotten and serve to inspire youth everywhere to be champions in life." Furlong — who even tried to reach out to francophone Canada with some halting words in French — quickly shifted to a more upbeat tone. "I believe Canadians tonight are stronger, more united, more in love with our country and more connected to each other than ever before," he said. "These games have lifted us up." He paid tribute to moguls skier Alexandre Bilodeau, winner of Canada's first gold medal at these games. "Alexandre, your gold medal gave us all permission to feel and behave like champions," Furlong said. "Our last one (the hockey gold) will be remembered for generations." The stadium literally shook as fans cheered and stamped their feet in appreciation. Neil Young, the durable Canadian folk-rock star, followed with a wistful version of his "Long May You Run" — and the Olympic flame faded away as he ended. The team was greeted with a mighty roar when they joined the fast-moving, informal parade of athletes into the stadium. Among the cheerleaders was Prime Minster Stephen Harper, wearing a Canada jacket. The U.S. flagbearer was Billy Demong, a veteran of four Olympics who won a gold and silver medal in Nordic combined. The comeback by the Canadian athletes was mirrored by the determination of the Vancouver Organizing Committee. It struggled with a series of glitches and weather problems early in the games, adjusted as best it could, and reached the finish line winning widespread praise for an exceptional Olympics — albeit one tinged with sadness.